Weiβ Schwarz Cards of the Day: 7th of March | TCG, shiyo? Miku reappears after only a one day break, and this time she’s joined by our second Red card, Meiko. [ACT][(1)] Choose 1 of your «音楽 Music» characters, during that turn, it gains Power +500. 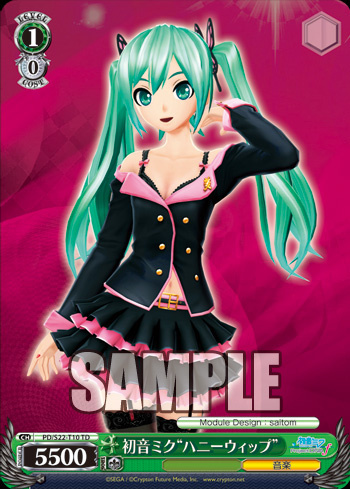 Hatsune Miku “Pansy” is the Project Diva Trial deck’s version of a basic Assist card. Her second effect is what separates her from being completely generic though. For a Stock you can give a «音楽 Music» character an extra 500 power, which might prove useful for winning battles during the early parts of the game. Later on she’ll be outclassed by better supports though. Since your Stock is the only limit on how much you can use this effect, you can overcome most opponent’s during the early game, however you’ll need to be careful not to waste lots of Stock. [CONT] ASSIST All of your characters in front of this card gain Power +X, where X is equal to the number of characters you have with [ASSIST] x 500. 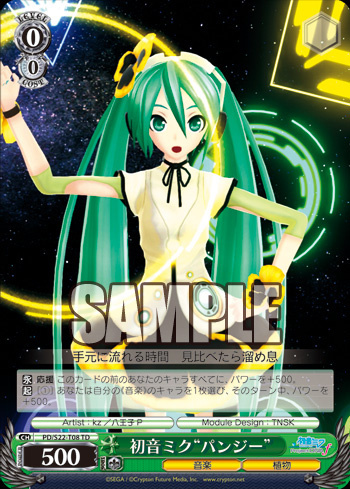 [ACT] [Rest this card] Choose 1 of your «音楽 Music» characters, during that turn, it gains Power +1000. 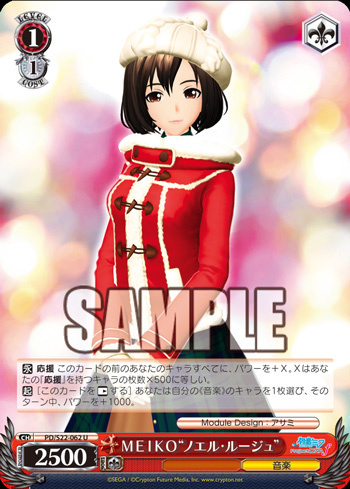 Meiko makes her first appearance with quite a powerful support card. For starters she’s one of the Assist reliant support cards, which gets stronger based on the number of Assist cards you have. This means that on her own she’ll only match a basic Level 0 support card, however when accompanied by another Assist card, she becomes as good as a basic 2/1 support card, giving +1000 to the cards in front. If you go any higher than this, by for example putting an Assist card on the Centre Stage, you could get impressive 1500 or more boosts, but this won’t usually be necessary. What sets her apart from other cards with this effect though, is her ability to give an extra +1000 Power to one of your «音楽 Music» characters, meaning she could fairly easily give a single character a +2000 boost. If you wanted to, 2 copies of Meiko could even give a Middle border card a +4000 boost, which is pretty impressive. Since she only needs to be Rested, you can conserve Stock for more powerful cards, unlike Miku from earlier, but it does mean you can’t repeatedly use the effect.